National Parks, nature parks, nature conservation areas and more lakes than in any other German state, widely untouched landscapes are waiting to be discovered by bike, boat, on horseback or hiking. More than 7,000 kilometres of newly built cycle paths lead you through idyllic landscapes while more than of 3,000 lakes and 30,000 kilometres of waterways and streams invite you to set your mind free and experience an unforgettable natural spectacle. 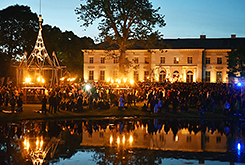 Also, Brandenburg is one of the most diverse cultural regions in Europe. With its many castles and gardens, including the UNESCO World Heritage Site in Potsdam, Brandenburg’s culture extends far beyond the typical tourist attractions in Berlin Visitors from all over the world come to see the stunning Sanssouci palace in Potsdam, together with its beautiful gardens. Brandenburg has numerous historic castles, manor houses, parks and historic buildings, all of which represent its history. The Lusatian Sorbs, a national minority, have their own distinct language and culture, contributing to the variety of the region. 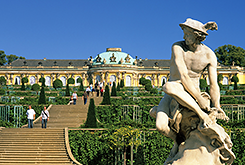 Brandenburg's Prussian Palaces and Gardens belong for sure to the must-sees when making a trip through the state. The Prussian Palaces and Gardens Foundation Berlin-Brandenburg (SPSG) takes care of many impressive sites, rich in history. According to the Guinness Book of World Records 2017 the largest indoor water park in the world. UNESCO biosphere reserve since 1991, famous for its traditional irrigation system, consisting of more than 200 small canals.